Back in 1964, the huge financial failure of The Fall Of The Roman Empire pretty much single-handedly buried the big-budget peplum genre, and it wasn’t until forty years later that new attempts at grand American sword and sandal epics were made. Indeed Gladiator‘s success back in 2000 slowly revived interest in the genre, which led to the release of no less than three such films in 2004: King Arthur, Troy and Alexander. Existing in three (very) different cuts, the film is obviously based on the life of Alexander The Great and follows the Macedonian king through his childhood, youth and tenure as king, his loves, conquests and relationships with friends and family. Directed by Oliver Stone (W.), who co-wrote the film with Laeta Kalogridis (Pathfinder) and Christopher Kyle (K-19: The Widowmaker). The cast for Quentin Tarantino’s Inglorious Bastards keeps growing as French up-an-coming César-winning actress Mélanie Laurent (Don’t Worry, I’m Fine) has signed on to play Shoshanna Dreyfus, a young Jewish girl who inherits a movie theatre in Paris and tries to avoid the Nazis (duh). The 25 year old Laurent isn’t Jewish, but I guess that’s beside the point. Inglorious Bastards, which has been a pet project of Quentin Tarantino’s for years, will be a remake of an Italian film from 1978 that is also known as G.I. Bro, Deadly Mission, Hell’s Heroes and Counterfeit Commandos. Described as in the vein of The Dirty Dozen, the film will tell the story of a group of Jewish-American soldiers behind enemy lines (France specifically) who spend their time scalping Nazis. In addition to Mélanie Laurent, the cast includes Brad Pitt (Burn After Reading), Mike Myers (The Love Guru), Eli Roth (director of the Hostel films), Samm Levine (Sydney White), Diane Kruger (the National Treasure films) and Til Schweiger (King Arthur). Inglorious Bastards will start filming next month in Berlin and is expected to premiere at next year’s Cannes Film Festival. Fun Fact: Mélanie’s father Pierre Laurent is the French voice for many Simpsons characters including Ned Flanders, Apu, Barney, Reverend Lovejoy and Smithers. Sorry it’s taken so long for a new “Movie Of The Day”. I’ve been quite busy in real life and trying to catch up with the plethora of movie-related news on the site. Who said remakes were a recent trend? The Dawn Patrol, a World War I movie directed by Edmund Goulding (A Night At The Opera), is based on an eponymous film helmed by Howard Hawks (Scarface) a mere eight years before. 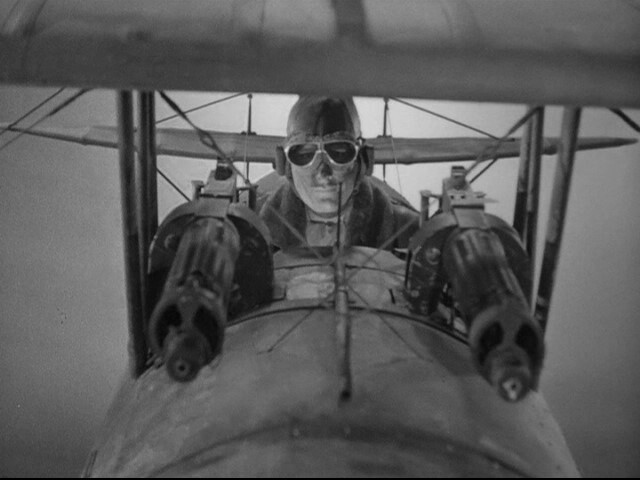 Adapted by Seton I. Miller (Pete’s Dragon) and Dan Totheroh (The Devil And Daniel Webster), The Dawn Patrol is set in 1915 and relates the routine of fighter pilots enrolled in the 39th Squadron of the Royal Flying Corps, focusing primarily on two of its members. The film stars some of the era’s biggest names, including Errol Flynn (The Adventures Of Robin Hood), David Niven (The Guns Of Navarone) and Basil Rathbone (a dozen Sherlock Holmes movies in the 30s-40s). Trailer and review after the jump. Witness a Miracle At St. Anna in five days! Do you live in or near Paris, the city of lights itself? If so, you can be among the first few to view Inside Man director Spike Lee’s latest film, the World War 2 drama Miracle At St. Anna, which premieres today at the Toronto Film Festival. The anticipated film will screen as part of a mini Spike Lee festival organized by the Cinémathèque Française. Go here to buy seats while you still can! 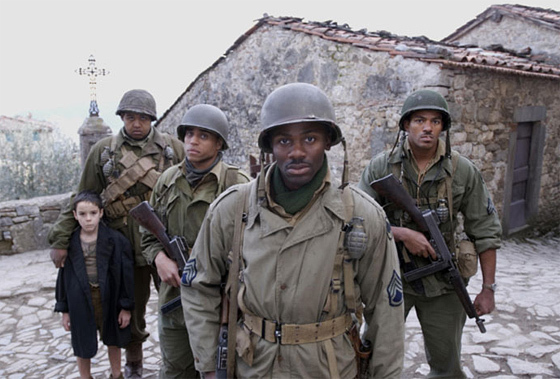 Miracle At St. Anna tells the story, through flashback, of four African-American “Buffalo Soldiers” who are trapped behind enemy lines in 1944 Tuscany, after one of them saved an Italian boy. It stars Derek Luke (Definitely, Maybe), John Turturro (You Don’t Mess With The Zohan), Joseph Gordon-Levitt (Stop-Loss), John Leguizamo (The Happening) and Kerry Washington (the Fantastic Four films) among others. Author James McBride wrote the script based on his own novel. Trailer after the jump.